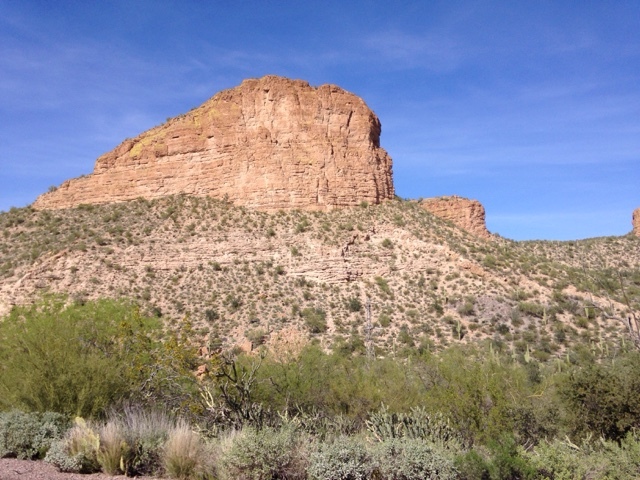 I am going to focus this blog on the dirt section of the Apache Trail between here, at Rosevelt Lake and the other end at Tortilla Flats, just east of Apache Junction. 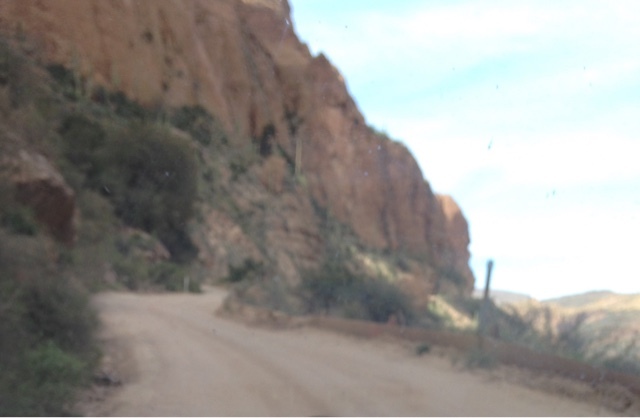 The Apache Trail extends in both directions on either side of this 20+ miles of dirt road but I will not be covering that. 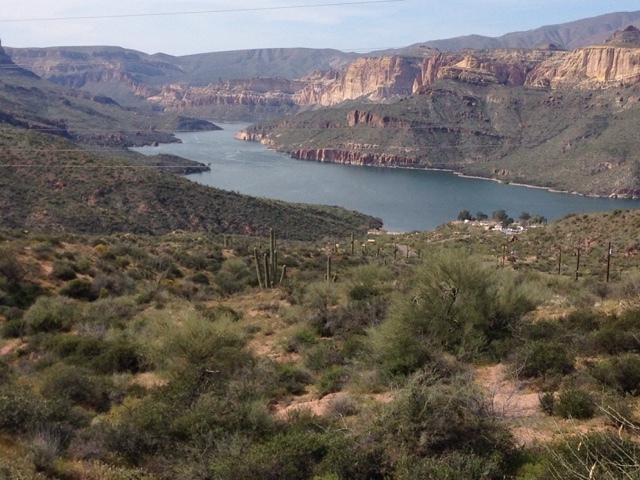 Prior to getting here today, I've already covered Tonto National Monument and the view of Rosevelt lake from the cliff dwellers home (see separate post) and this is on Apache Trail as well. 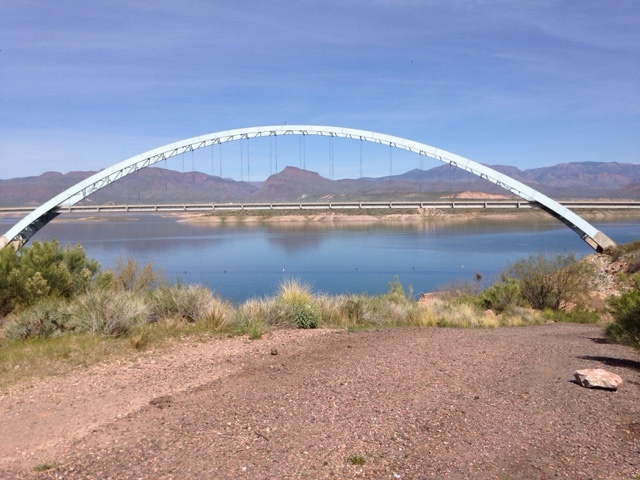 This bridge that crosses by the dam that retains the water in Rosevelt Lake heads north to Payson, AZ. The sign preludes you to the trail. Certainly driving on asphalt doesn't feel like a trail. This next drive feels like they took the trail and widened it for a car. In some places it is so narrow there is space for only one car. My shot of the bridge looking back at Rosevelt Lake before I start the sometimes arduous trek to Tortilla Flats. 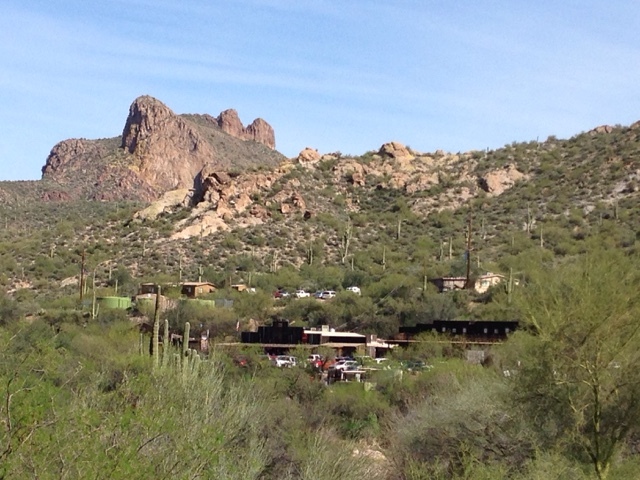 The reason I came was for the Tonto National Monument and the beauty of the scenery of this section of the road. 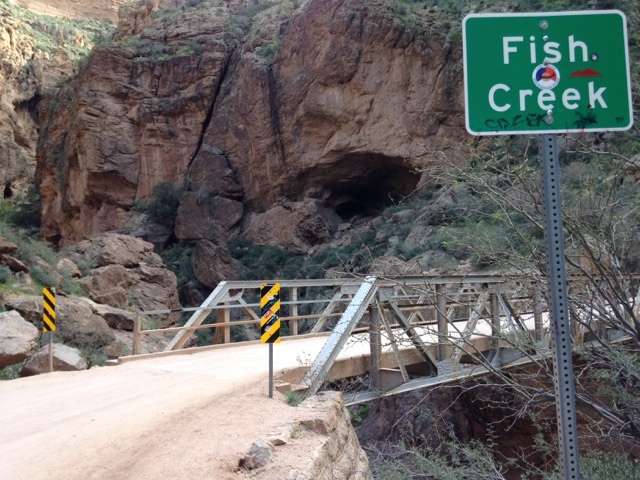 The Apache Trail takes you up and down the side of the canyon. Also around the inlets of wet or dry estuaries. The woman I called L, that I met at the cliff dwellings, had been on this road and advised that I take some of the side roads down to the waters edge. I took one such turn off the main road where the side road was less maintained but fine for the Prius, until I got to one of the never ending cattle guards that are on the rosds out here. The road as I approached the cattle guard was higher than the cattle guard, but I thought I should make it. I slowly put my front wheels down on the cattle guard and bang! I bottomed out. I rolled forward and I was not hung, but to continue could mean that I could hang so I backed up and bang I bottomed again before my front wheels grabbed and lifted me up on the dirt road again. I couldn't make it with the Prius, so I can't show a picture from the waters edge. This is blurry as I shot it through my windshield as there is no guardrail a and no spots to pull off on the inclines. I met 3 other cars on this one narrow spot Olin the road. I'm on the uphill side with the passenger side on the cliff. I have to put my tires on the dirt brim (cliff edge) so the other car could pass. I didn't get the kind of pictures to show you the thrill I had driving this piece of road with white knuckles. I paused to think of my friend Karen who used to work with me. She would have had her excellent digital camera strapped around her neck out the passenger window, in all her wide eye wonderment, snapping wonderful looking photos chronicling this adventure. She would be an asset on my travels taking pictures. 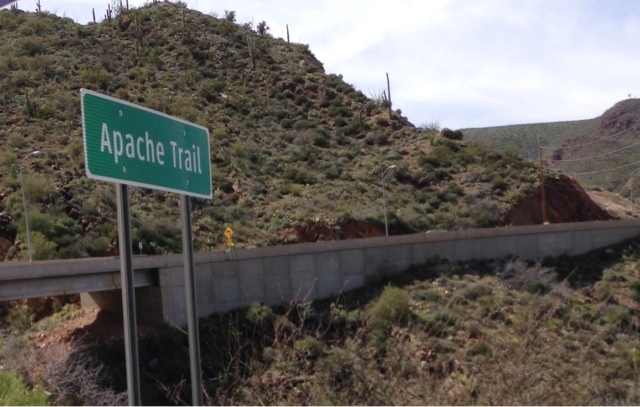 You just have to settle on the few places I could stop on Apache Trail and take a photo to include here. 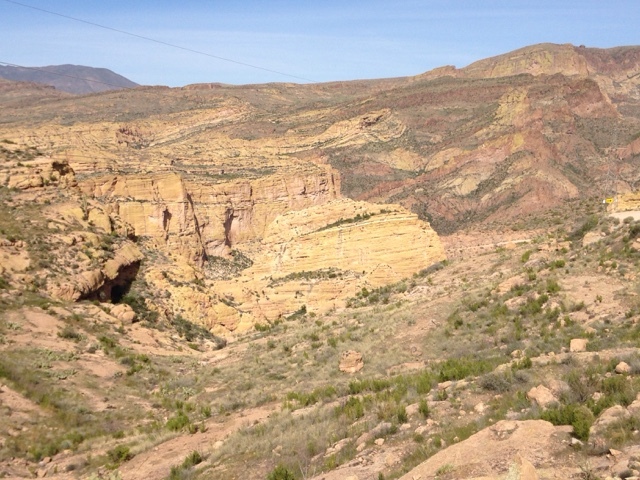 There is a variety of scenery that changes based on being on top of the cliff or down at the bottom. This is all federal land and there is one commissioned resort that the Federal Government leases that you can go to and stay. For me, there are a few places that it appears that disbursed camping is allowed but it is my belief that you need to obtain a Tonto Pass that is sold at stores that is $8.00 per day. I made it through to the other end, now carrying 20 lbs of dust on the Prius from the trip. Tucked in the green in the picture is Tortilla Flats. It's basically a tourist stop with a restaurant and mercantile exchang (general store). I'm glad I made the trip. I have been on more dirt roads with the Prius this year than last year. I have also been to more car washes too.